View and explore complex hierarchical information. View key performance indicators (KPIs) in the contextual view of a hierarchy. Visually analyze key information across the web and the tablets. For some entities, such as account and user, the visualizations are provided out-of-the-box. Other entities, including custom entities, can be enabled for a hierarchy and you can create the visualizations for them. Based on your needs, you can choose between using a tree view, which shows the entire hierarchy, or a tile view, which depicts a smaller portion of the hierarchy. Both views are shown side by side. 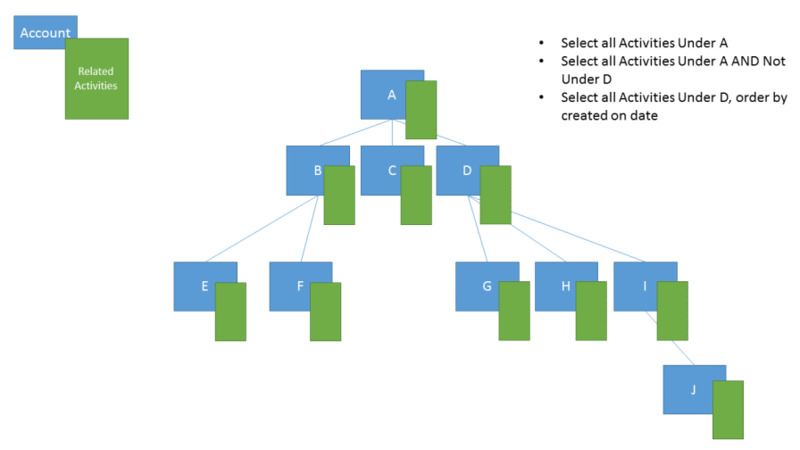 You can explore a hierarchy by expanding and contracting a hierarchy tree. 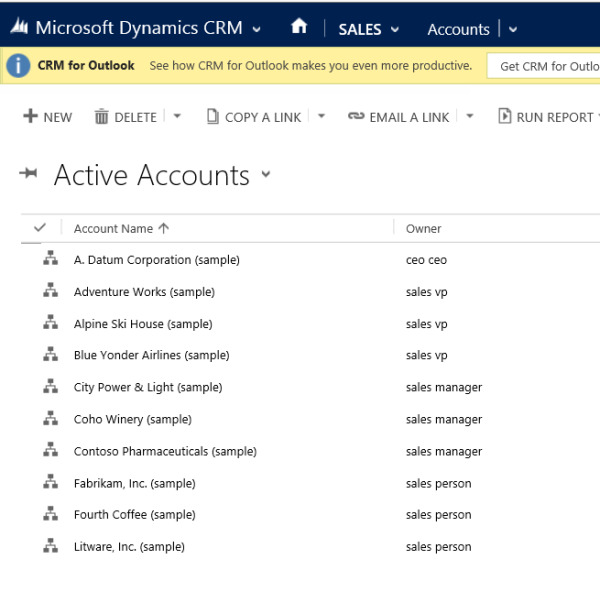 The same hierarchical settings for visualization are set once, but apply to both Microsoft Dynamics 365 and Microsoft Dynamics 365 for tablets. In tablets, the visuals render in a modified format suitable for the smaller form factor. The customizable components required for hierarchical visualization are solution aware, therefore, they can be transported between organizations like any other customization. You can configure the attributes shown in the visualization by customizing a Quick Form using the form editor. There is no requirement to write code. Choose Customize your system > Components. 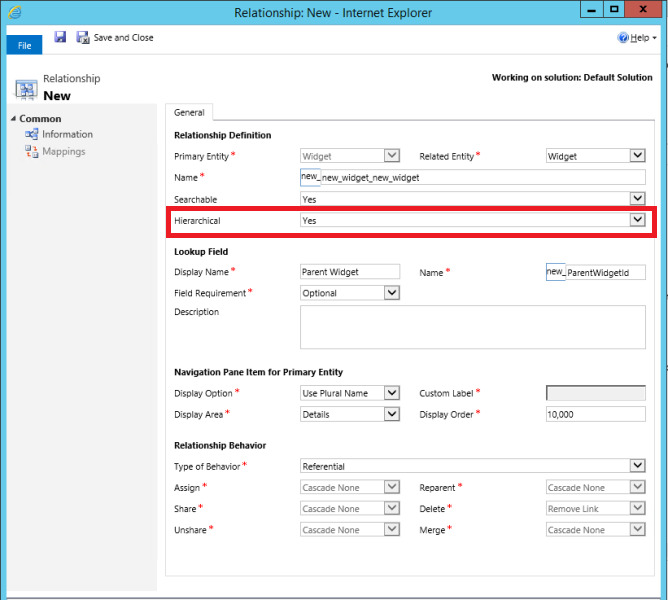 Choose Entity > 1:N Relationships, then choose a (1:N) relationship and in the Relationship definition, set Hierarchical to Yes. Some of the out-of the-box (1:N) relationships can’t be customized. This will prevent you from setting those relationships as hierarchical. You can specify a hierarchical relationship for the system self-referential relationships. This includes the 1:N self-referential relationships of system type, such as the "contact_master_contact" relationship. The system entities that have visualizations available out-of-the-box include Account, Position, Product, and User. In the grid view of these entities, you can see the icon depicting the hierarchy chart, to the left of the record name. The hierarchy icon isn’t present for all records by default. The icon is shown for the records that have a parent record, a child record, or both. A few other out-of the-box system entities can be enabled for a hierarchy. These entities include Case, Contact, Opportunity, Order, Quote, Campaign, and Team. All custom entities can be enabled for a hierarchy. Choose Customize your system > Components > Entity. 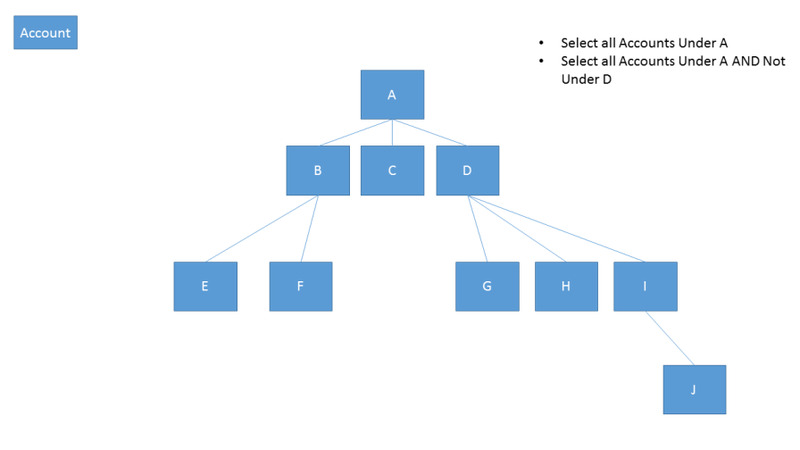 You will see the selection called Hierarchy Settings. The entities that can’t be enabled for a hierarchy don’t have this selection, with the exception of the Sales Territory entity. Although Hierarchy Settings appears for the Sales Territory entity, the entity can’t be enabled for a hierarchy. Only one (1: N) self-referential relationship per entity can be set as hierarchical. In this relationship the primary entity and the related entity must be of the same type, such as account_parent_account or new_new_widget_new_widget. Presently, a hierarchy or visualization is based on one entity only. 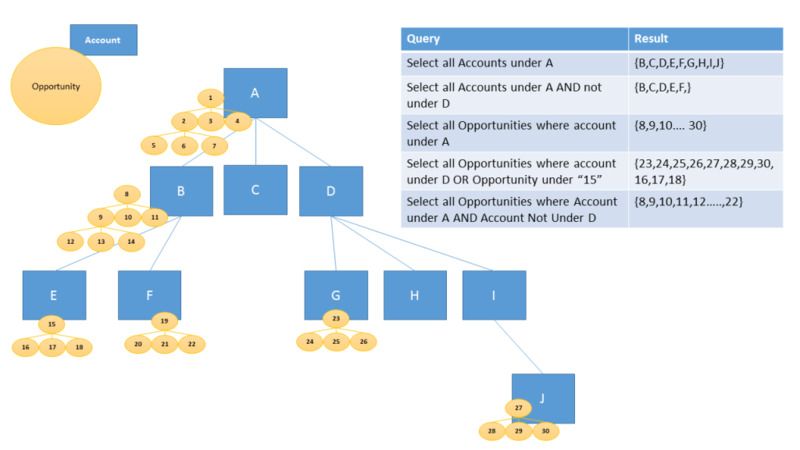 You can depict the account hierarchy showing accounts at multiple levels, but you can’t show accounts and contacts in the same hierarchy visualization. Maximum number of fields that can be displayed in a tile is four. If you add more fields to the Quick Form that is used for the tile view, only the first four fields will be displayed. Let’s look at an example of creating the visualization for a custom entity. We created a custom entity called new_Widget, created a (1:N) self-referential relationship new_new_widget_new_widget and marked it as hierarchical, as shown here. Next, in the Hierarchy Settings grid view, we selected the new_new_widget_new_widget hierarchical relationship. In the form, we filled in the required fields. If you haven’t yet marked the (1:N) relationship as hierarchical, the link on the form will take you back to the relationship definition form, where you can mark the relationship as hierarchical. For the Quick View Form, we created a Quick Form called Widget Hierarchy Tile Form. In this form, we added four fields to display in each tile. The hierarchy icons don’t appear in the record grid view until the records are paired in the parent – child relationship. Choosing the hierarchy icon displays the new_Widget hierarchy with the tree view on the left and the tile view on the right, showing two records. 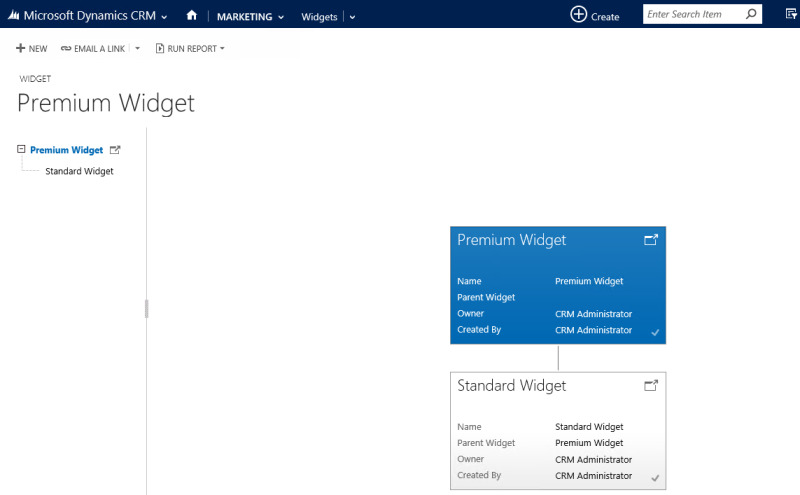 Each tile contains four fields that we provided in the Widget Hierarchy Tile Form.